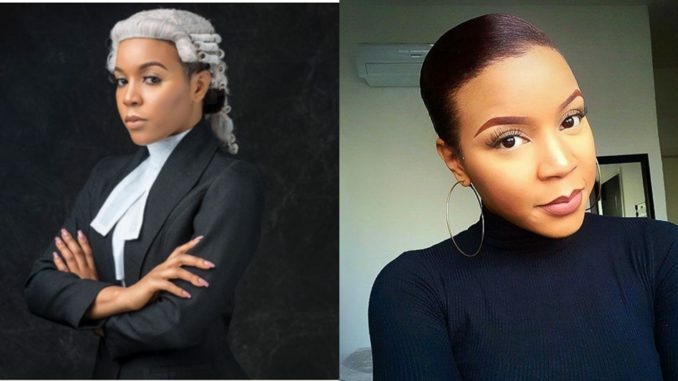 Beauty entrepreneur, Lola OJ was called to bar on Wednesday and she shared the good news on social media but a follower believes the law profession isn’t for her. The follower, Adewole Temitope told the vlogger that they wouldn’t hire her services and they weren’t sure she could defend anyone in court. 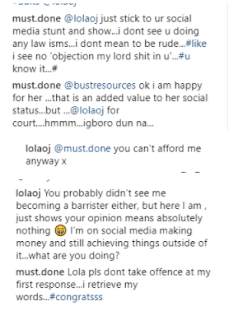 Temitope added that Lola should stick to her social media business. 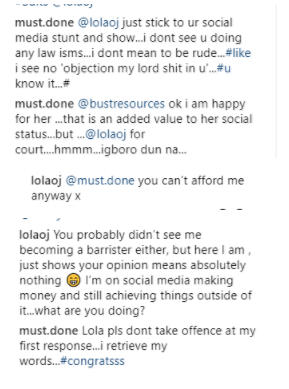 In response, Lola slammed Temitope, says the follower can not even afford her. The beauty entrepreneur added that she is on social media making money and then asked the troll what they’ve done with their life.